1 x A4 x 100gsm full colour sheet White and pink Roses feature on this sheet making them the perfect compliment to so many pages, cards and projects. These flowers are so easy to cut out or you could cut around them using the background to add a bit of colour to your chosen design. Five paper tole design projects are shown on this sheet of A4 100gsm paper. 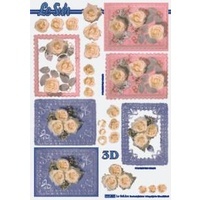 These are great for card making, Scrapbooking, Pictures, invitations and many other paper craft projects. 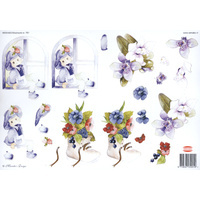 So easy to do, just cut out the main picture, mount it and then continue cutting the following pictures until your design is complete. Each layer is raised in height by using double sided foam tape, foam dots or silicone. 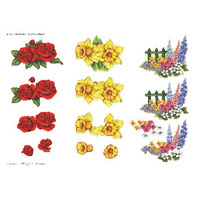 For added strength you can back the papers with card, they don’t really need it unless you are going to frame The finished designs may also be sold commercially although reproducing the original sheet will be seen as a breach of copyright.